[Updated below: updates #2, #3, #4, and #5 below] Here is the text of an email that I sent to Dean Kent Kleinman (College of Architecture, Art, and Planning, Cornell University; copied to numerous other relevant parties) dated March 5, 2012. I have written previously about the Milstein dome crit space egress problem here. I am concerned that events are being planned “under the Milstein Hall dome” and in other spaces in Sibley Hall that may involve more than 49 occupants… Two exits separated by a minimum Code-specified distance are required in such cases, and neither the Milstein dome crit space nor room 261 E. Sibley Hall meet those standards. I have already raised this concern about the Milstein dome with Gary Wilhelm and Peter Turner (email dated 9/30/11, copied to Mike Niechwiadowicz) and about 261 ES with Rich Jaenson (email dated 2/20/12). Wilhelm explained to me that a second remote exit from the dome crit space is actually further down the corridor outside the dome itself — an explanation that does not satisfy the egress requirements for fire safety in the NY State Building Code (Wilhelm’s interpretation is explicitly contradicted by a “technical opinion” requested from the International Code Council which I have attached [see below]; this opinion strongly confirms my judgment that the dome space cannot legally support occupation by more than 49 people; the same logic applies to 261 ES if a second marked and non-lockable exit is not provided). Cornell has already lost a court case concerning spaces with only one exit that are used for occupancies greater than 49 people (this case concerned, among other rooms on campus, 157 E. Sibley Hall; for details, see here). In the case of room 261 E. Sibley Hall, posted occupancy signs permit from 112 to 300 people in the space even though two remote exits are not provided. I am not clear whether a building permit was obtained for this change of occupancy from the old Fine Arts Library stacks (with a Code-sanctioned occupancy of approximately 15 people) to a space for 300 people, but recent experience has shown that even building department review does not guarantee Code compliance. Cornell, through the ILR school, maintains an excellent web site devoted to the Triangle Factory Fire of March 25, 1911 (here), a disaster that was caused, in part, by a cynical and dangerous attitude toward egress. One would think that over 100 years later, the lessons of that tragedy would resonate more clearly in the actions taken within the architecture school. Email from Michael W. Giachetti, P.E. to Jonathan Ochshorn received March 5, 2012, based on Ochshorn’s description of the conditions in the Milstein dome crit space, as illustrated in his blog post dated Oct. 11, 2011. Section 1015.2.1 requires the exit doors or exit access doorways to be placed a distance apart equal to not less than one-half of the length of the maximum overall diagonal dimension of the area to be served or one-third the length if the building is sprinklered. In applying the provisions of this section, it is important to recognize any convergence of egress paths that may exist. While the actual exit doors or exit access doorways may be remote, if the paths either before or after these doors converge, then remoteness would not be satisfied. In your example, including the area of the corridor as part of the “room” does not change the fact that the two paths into the corridor are not remote. As such, including the area of the corridor as part of the “room” does not resolve the problem with remoteness. Code opinions issued by ICC staff are based on ICC published codes and do not include local, state or federal codes, policies or amendments. This opinion is based on the information which you have provided. We have made no independent effort to verify the accuracy of this information nor have we conducted a review beyond the scope of your question. This opinion does not imply approval of an equivalency, specific product, specific design, or specific installation and cannot be published in any form implying such approval by the International Code Council. As this opinion is only advisory, the final decision is the responsibility of the designated authority charged with the administration and enforcement of this code. Please let me know the basis for your conclusion that the “crit space” under the Milstein Hall dome can be occupied by more than 50 persons, even though the actual exits from the space do not comply with Section 1004.2.2.1 of the 2002 NY State Building Code (Two exit or exit access doorways). Do you accept Gary Wilhelm’s explanation that two non-compliant exits (non-compliant because they are too close together) can be made compliant by changing nothing about the actual exit geometry, but by merely labeling one of the two exits as being further down the corridor? If you do not accept Gary Wilhelm’s explanation, then what is the basis for your conclusion? Note that more than 500 persons are likely to converge on this “crit” space Friday and Saturday nights this week at the invitation of the College of Architecture, Art, and Planning. Any assembly occupancy with “standing space” (as this crit space is configured, see Table 1003.2.2.2 of the 2002 NYS Code) must actually have three exits rather than just two if it is large enough to accommodate 501 or more people (which this crit space is, having more than 2505 square feet of floor area, and assuming 5 square feet per occupant per Code instructions). Thus, you seem to be permitting this space to be occupied with only a single legal exit even though three exits are actually required. [Update #2: March 8, 2012] I received a reply and explanation from the City of Ithaca Building Department on March 7, 2012 which I copy below, followed by my March 8, 2012 response. 2003 Building Code of NYS Section 1004.2.5 (equivalent in 2010 Building Code of NYS Section 1014.3) ‘Common path of egress travel’ allows a 75 foot common path of travel before access to two exits is required. The definition of ‘common path of egress travel’ is in Section 1002. Basically, for up to 75 feet only one path to the two exits is required. The Crit space meets this requirement; therefore, it does have two code compliant exits. Occupancy of the space is limited to 349 because there are only two exits. Thanks for your prompt response to my questions. I am happy to see that you have rejected the argument advanced by Gary Wilhelm. Unfortunately, the argument you employ to justify having two noncompliant exits in a space with more than 50 occupants (actually more than 500 potential occupants) is equally dangerous and specious. Needless to say, I strongly disagree with your conclusions. 1. The Code is quite clear that the requirement in Section 1004.2.2.1 of the 2002 NYS Code (equivalent to Section 1015.2.1 of the 2009 IBC) for two remote exits from spaces with 50 or more occupants is in addition to the maximum common path of travel limit specified in NYS Code Section 1004.2.5 (equivalent to 2009 IBC 1014.3). Both requirements must be met. There is no exception under Section 1004.2.2.1 of the 2002 NYS Code (equivalent to Section 1015.2.1 of the 2009 IBC) for situations where the common path of travel limit is satisfied. The common path of travel limit is a separate regulation that must also be satisfied. Satisfying this limit for common path of travel does not give you permission to violate other provisions of the Code. Reading the Code wording carefully, it is clear that Section 1004.2.2.1 of the 2002 NYS Code is not an “allowance” but rather a requirement: “In occupancies other than Groups H-1, H-2 and H-3, the common path of egress travel shall not exceed 75 feet.” Thus, the section does not “allow a 75 foot common path of travel before access to two exits is required,” as you state, but rather requires that such common paths of travel “not exceed 75 feet.” The Code requirement for a limit on common paths of travel in no way permits you to disregard equally valid requirements in the Code requiring that two exits be placed a minimum distance apart. Under your reasoning, it is not even clear why two exits would be needed, since that requirement is in the same Code section as the requirement that the two exits be “placed a distance apart…” Since you’ve discarded the latter rule, why not the former as well? And while we’re discussing exit requirements, why not also discard the requirements for minimum exit width. For example, in a space with 100 occupants, each requiring 0.15 inch of exit width or 15 inches total, why not do away with the two-exit requirement since a single 36-inch door seems to satisfy this provision? The point is that all of these separate requirements must be met: the common path of travel cannot exceed 75 feet and there must be two exits and the two exits must be separated by a Code-specified minimum distance and the total exit width must also comply with the Code. Satisfying one of these requirements is not sufficient. All must be satisfied. According to your logic, there would be no need for a second remote exit in Room 157 E. Sibley Hall — this was one of the spaces subject to a lawsuit brought by (and lost by) Cornell — since the common path of travel from the most remote corner of that room to a point outside with two separate egress paths is no greater than 75 feet. Are you willing to re-argue that case as well? Please reconsider your judgment. The safety of Milstein/Sibley/Rand occupants is at stake. Are you really suggesting that satisfying the requirements for common path of travel allows you to violate Section 1004.2.2.1 of the 2002 NYS Code (equivalent to Section 1015.2.1 of the 2009 IBC)? And for the architects involved in this decision: note that you cannot rely upon the opinion of the City of Ithaca Code officials to defend yourself in the event of any litigation. You, and not the Code officials, are charged and licensed by the State of New York to protect the health and safety of building occupants. Please don’t wait for a disaster to occur: act now. The architects working for OMA should be particularly sensitive to the real risk of fire in buildings that they design or renovate. 2. On a separate but related note, how do you compute a limit of 349 occupants for two exits? Why isn’t the limit equal to 500 (assembly occupancy with “standing space”). The crit space would certainly be large enough to accommodate that occupant load — that is, if it had two remote exits, which it doesn’t. Here are the facts — not “interpretations.” I’m referencing the 2009 IBC, but the same language and intent appear in the NY State Codes. 1. IBC Section 1014.3 requires that any common path of egress travel not exceed 75 feet, with “common path of travel” defined as that portion of exit access which the occupants are required to traverse before two separate and distinct paths of egress travel to two exits are available. 2. IBC Section 1015.1 requires that two exits be provided for spaces with more than 49 (or 50 in the older versions of the Code) occupants — or three exits for spaces with more than 500 occupants. The determination of number of occupants is not discretionary, but is governed by the floor area of the space and its occupancy classification, per IBC Table 1004.1.1. For example, the crit space in Milstein Hall must be designed for more than 500 occupants since it can be occupied, and is intended to be occupied, as “assembly standing space” with 5 square feet per occupant, and it has a floor area greater than 501 x 5 = 2505 square feet. 3. IBC Section 1015.2.1 requires that where two exits are required, they be placed at a distance apart equal to not less than 1/3 the length of the maximum overall diagonal dimension of the area served. That’s all. There is nothing in the Code that says you can ignore any of these requirements for any reason relevant to this discussion. This is not my “interpretation.” These are facts taken directly from the Code. Do you “respectfully disagree” with any of these facts? In contrast, you have not referenced a single sentence in the Code that indicates, hints, or suggests in any way that the “remoteness” requirement of IBC Section 1015.2.1 can be ignored. Unless you can point to some language in the Code that supports your position (and you can’t, because there is no such language in the Code), these spaces in Milstein and Sibley Hall are being occupied illegally, presenting a danger to the faculty, students, and staff who use them. Your prior suggestion that the common path of travel requirement of IBC Section 1014.3 allows spaces to be configured in violation of the “remoteness” requirement of IBC Section 1015.2.1 is not supported by any Code language and is contradicted by very specific Code language. To invent something out of thin air that contradicts specific Code language is not an “interpretation.” Rather, it is a flagrant abuse of authority. I again ask that you reconsider, and at least obtain a “second opinion” from New York State or ICC Code experts before closing the book on this issue. [Update #4: March 11, 2012] I’ve already shown that the argument about the Milstein crit space advanced by the City of Ithaca Building Department — that meeting the common path of travel limit of 75 feet exempts one from any requirement that the two exits be remote from each other — has no basis in the Code and, in fact, is dangerous and incorrect. 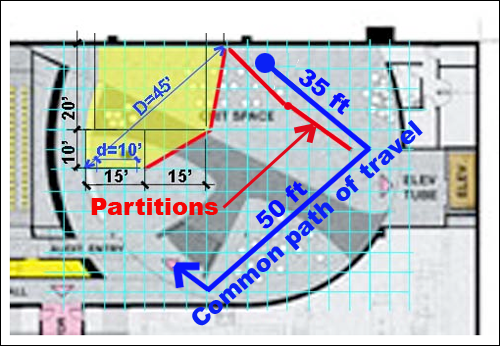 I wish to note, however, that even that incorrect logic cannot be sustained in this particular case: the Milstein Hall crit space, especially with its permanent partitions, does not even come close to meeting the common path of travel limit of 75 feet. So the space is actually doubly dangerous, being noncompliant under both of these Code sections. [Update #5: April 19, 2012] I finally figured out why Ithaca Deputy Building Commissioner Mike Niechwiadowicz insists that the crit space under the Milstein Hall dome be limited to 349 occupants, even though the standard limit for two exits is 500 occupants. The 2002 NYS Building Code, while based on the International Building Code, has a special NYS-only provision requiring a third exit in Assembly occupancies with 350 or more occupants. None of this matters, however: there are not two remote exits in the space, so the point is moot. And even if there were two remote exits, the space is still noncompliant since — based on its occupancy and floor area — three exits are required. The Code does not permit a room to have insufficient exits merely because some sign is posted limiting occupancy to an unrealistically low number. This strategy may well be employed in existing buildings that need to comply with modern building codes, but it is not permitted for new construction. This entry was posted in Architecture, Milstein-Rand-Sibley Hall on March 5, 2012 by jonochshorn.